BalanceTalk CE is a portable solution that uses a Pocket PC to efficiently and accurately capture readings from any balance or scale equipped with an RS232 port. Rather than dedicating a desktop PC to each balance, you can place an RS232 cradle beside the instrument. To interface to the balance, simply slide the Pocket PC into the cradle, select the test you want to perform and begin collecting data. When all of the samples are analyzed, move on to the next workstation and collect more data. At convenient intervals, return the Pocket PC to a central PC and place the Pocket PC in its? cradle. New files from the Pocket PC are instantly uploaded (synchronized) with the desktop PC. If the PC has LIMS interfacing software, such as LimsLink, data from the Pocket PC can be automatically synchronized directly to the LIMS. Includes Pocket Excel® spreadsheet templates that are formatted for many common weighing applications such as sieving, moisture analysis, Total Suspended Solids, etc. 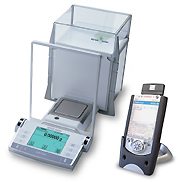 The combination of Pocket PC technology with BalanceTalk CE software provides a cost-effective solution that brings significant increases in efficiency to any lab. Eliminating the need to have a desktop PC beside each balance dramatically reduces the cost of interfacing each instrument. The relative cost of interfacing the balance is now in line with the cost of the instrument. Additionally the interfacing solution requires very little space on the lab bench, further reducing the interfacing cost. The benefits of increased efficiency, and decreased transcription errors are easily cost-justified. BalanceTalk CE runs on the Microsoft® Pocket PC 2002 operating system and has been fully tested using the IPAQ 3950 Pocket PC. Installation requires approximately 1.5 MB of storage space, and the Pocket PC must have an RS232 connection.